Description: Rare annual consisting of 5 stories in picture strip format – 4 captioned, full-colour frames to a page – plus instructions on how to make a paper hare or rabbit. 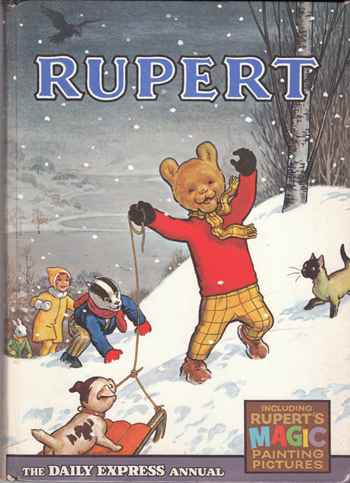 Beautifully illustrated pastedowns and endpapers depict "Rupert's own Countryside". Glazed pictorial boards. Corners and spine bumped. The latter has some very slight damage at the head. Ownership panel contains previous owner's name and address neatly printed in blue ballpoint. Not price-clipped (bears original price of 6/-). Magic Paintings completed. Pages are in excellent, unmarked condition. Measures 25 cm × 18.5 cm (10″ × 7.4″). 4to. 114 pp.